South African batsman Colin Ingram won the award for the One-Day Cup while captain Jacques Rudolph took the honours for the T20 Blast. All-rounder David Lloyd, 23, picked up club and St Helen's Balconiers Awards for young player of the year, after becoming a first-team regular. Glamorgan have also named Robin Saxton as head groundsman for a year. He was previously assistant to Keith Exton, who has left the club. Wagg, 32, was third top run-scorer in the Championship with 838, including a career-best 200 against Surrey, and was also second highest wicket-taker with 45, just behind Michael Hogan. Lloyd had an impressive Championship batting average of 39 despite going in anywhere between three and ten in the order, as well as acting as the fourth seam bowler. 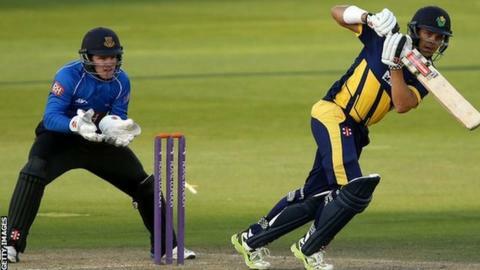 Ingram turned in a remarkable series of innings in the 50-overs game with centuries against Kent, Essex and Middlesex in the space of just five visits to the crease. "I thoroughly enjoyed that middle period when all went well, I just used that momentum and used the same formula over and over. I just want to keep it simple and come back next year and put in a few more performances for us." Despite being top scorer in the four-day format, Ingram admits he was frustrated with his championship performances and has had to work on his technique in British conditions. "Towards the back end of the season, I've started to find a formula that can be more consistent next year. I'm pretty disappointed not to get a thousand runs but lots of positives to work on for next season." Ingram has already returned to South Africa to prepare for his new season with the Warriors while Rudolph flew back straight after the final match to be with his wife and new-born son. But he was named T20 player of the season after scoring 461 runs at an average of nearly 42 in the competition, as well as his captaincy duties across all three formats. "It's been an interesting season for me," said Rudolph. "We played a very positive brand of cricket especially when we had our backs against the wall, and I will keep driving that message home because we want to push for promotion [in the championship]." Teenage batsman Aneurin Donald was second eleven player of the year, Kiran Carlson was academy player of the year, and Tom Murphy most promising academy player. The awards dinner was held in Swansea and hosted by the Balconiers supporters group.